The BRM Aero Bristell was displayed at this year’s U.S. Sport Aviation Expo at Sebring Regional Airport. Several companies have relocated from the coasts to Sebring Regional Airport to take advantage of better land prices while still having access to both rail and highway truck infrastructure, according to Mike Willingham, executive director of the Sebring Airport Authority. In this file photo, workers pick oranges in a citrus grove near Sebring. SEBRING — A new report out from Business Roundtable research states that Florida’s economy has become increasingly dependent on international trade. Some basic information about the industries operating in Highlands County supports this assertion, given the potential for international markets with locally-grown or manufactured goods. Business Roundtable is an association of chief executive officers of leading American companies working to promote a thriving U.S. economy and expanded opportunity for all Americans through sound public policy. A recent report from Business Roundtable states that exported goods and services accounted for 9.8% of Florida’s gross domestic product in 2017, with exports growing faster than the state’s GDP since 2007.
Business Roundtable states Florida can count nearly 2.4 million jobs — one in five — that are supported by exports from Florida and imports to the United States through Florida. 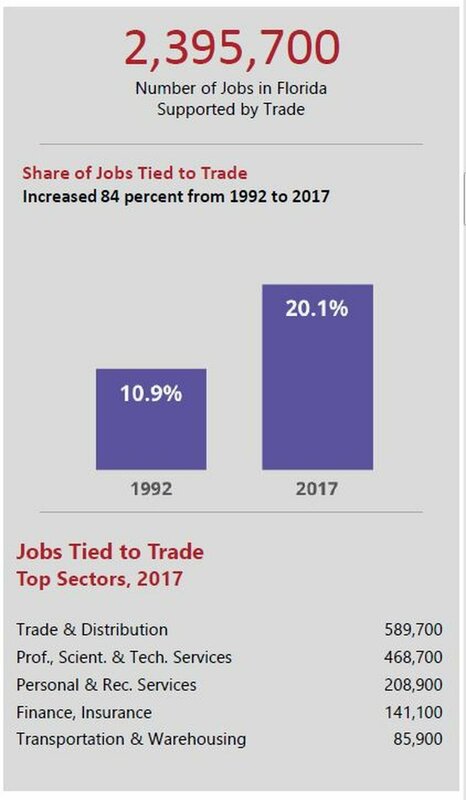 Those trade-related jobs grew three times faster than total employment from 1992 to 2017, and exist throughout the economy, the report states: At large and small companies, on farms and in factories and at headquarters of Florida-based firms that operate globally. Florida exported $52.9 billion in goods and $43.3 billion in services in 2017, the report states. That includes greenhouse and nursery products, pesticides and fertilizers, ships/boats and travel services. Of those 58,104 exporters, the Business Roundtable states 95 percent of them are small to medium-sized companies with less than 500 workers. Florida’s exports have grown 40% faster than the Gross Domestic Product since 2007, Business Roundtable states, and lower raw material and input costs help Florida companies stay competitive in global markets. Right now, several companies have relocated from the coasts to Sebring Regional Airport to take advantage of better land prices while still having access to both rail and highway truck infrastructure, said Mike Willingham, executive director of the Sebring Airport Authority, which has a free-trade zone encompassing the property. A free-trade zone allows companies to land, handle, manufacture/reconfigure and re-export materials and goods without intervention from customs authorities. It allows companies operating at the airport to bring in materials and export products freely, something that Willingham is sure companies do, or will use to their full advantage. He’s not exactly certain how many companies export and/or import and he doesn’t have exact numbers on their volume of goods in and out, but Willingham said Diversified CPC brings in butane by rail for Florida and international customers. Hancor ADS and GenPac likely have some limited export, Willingham said, and he is sure Gulf Coast Supply probably has exports, as well. Diversified CPC was also one company that moved to Sebring, Willingham said, to take advantage of rail service and better land prices. That company gets materials by rail and sends finished products by truck to ports or distributors, Willingham said, as does GenPac. “We’re poised to do well with these relocations,” Willingham said. Business Roundtable also states that foreign companies have invested in Florida-based facilities and employ 348,000 workers in Florida. Furthermore, Business Roundtable states that export-dependent industries pay roughly 16% more than jobs in less export-intensive industries.